Earlier this week, we called attention to a bill passed by the Turkish Parliament which effectively criminalizes administering emergency medical aid without government authorization. Read that first sentence again and you’ll have an sense of how Kafkaesque conditions in Turkey have become. Sadly, President Abdullah Gul signed the bill into law yesterday, January 17. © Nar Photos/ Adnan Onur Acar Used by Permission. As we noted in an earlier blog, there are already clear indications that authorities are already targeting medical personnel as part of their general crackdown after the Gezi Protests this past June. International organizations and the U.N. Special Rapporteur on the right to health had been highly critical of the bill. Critics contend that the law could be used by the police and prosecutors to intimidate and punish doctors and other medical workers for treating protesters wounded in demonstrations against the government, like those in Turkey last year. 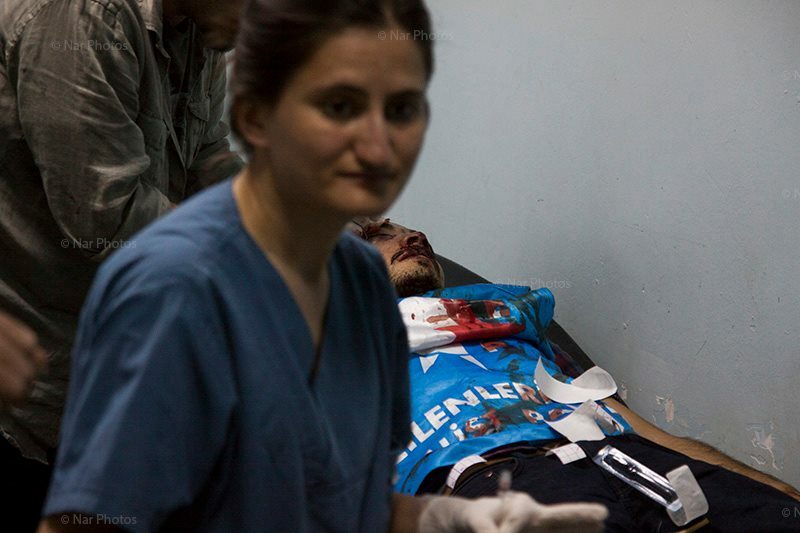 “Passing a bill that criminalizes emergency care and punishes those who care for injured protesters is part of the Turkish government’s relentless effort to silence any opposing voices,” said Dr. Vincent Iacopino, senior medical adviser at Physicians for Human Rights, one of the groups that had campaigned against the legislation. If convicted, violators could be imprisoned for up to three years and face fines of nearly $1 million. In addition to violating international standards and medical ethics, the bill conflicts with the Turkish Penal Code, which makes it a crime for doctors to neglect their duty of providing medical care. Abdullah Gül, president of the Turkish Republic, today signed the bill into law. Medical professionals could be imprisoned for up to three years and fined up to approximately $985,000 for providing essential medical services. The bill will put doctors in direct conflict with their ethical and professional responsibilities to care for the sick and wounded. It is part of the Turkish government’s continuing effort to harass the medical community for treating those in need, including demonstrators injured during last summer’s anti-government protests. This entry was posted in Excessive Force, Freedom of Assembly, Freedom of Expression, Turkey and tagged Abdullah Gul, Diren Gezi, excessive force, Gezi Park, Human Rights, medical ethics, Physicians for Human Rights, protests, taksim square, Turkey. Bookmark the permalink.